Glamorgan's Michael Hogan says team-mate Jim Allenby is good enough to play for England. Australian-born Allenby is eligible after moving to the United Kingdom 14 years ago. The 31-year-old is frustrated not to have gained any recognition but Hogan thinks he is in with a chance. "If he puts another season on the board like he did [last year] then I don't see why they wouldn't pick him," he said. All-rounder Allenby scored more than 2,000 runs in all cricket, and 1,200 in the first-class game for Glamorgan last season. He captured four wickets in Glamorgan's opening County Championship win over Surrey and has not given up on representing England. Australian Hogan does not believe playing for a second tier County Championship side is a hindrance to Allenby's England ambitions. "They're picking guys from the second division now which people thought maybe they wouldn't be doing," fast-bowler Hogan added. "But they had Michael Carberry playing in the Test series and Moeen Ali's playing the one day form now. "They've shown if you put consistent performances on the board then they'll pick you." 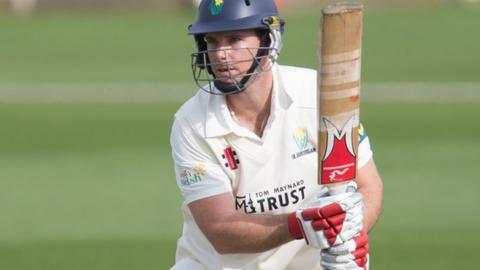 Allenby has overcome an ankle injury to be included in Glamorgan's match squad for their first home County Championship game of the season against Gloucestershire, starting on Sunday. Bragg, Rees, Walters, Rudolph, Goodwin, Allenby, Wallace, Wagg, Smith, Cosker, Hogan and Owen.